Wind farm models may be built with different detail levels ranging from one-to-one modeling or by an aggregated model that consists of one or few equivalent wind turbines and an equivalent of the internal network. The aggregated model includes: wind turbine units, compensating capacitors, step-up transformers, etc. Fig. 25 compares the detailed and the aggregated models. The aggregated model can be used to verify a wind installation according to PVVC when all the wind turbines that form the wind installation are of the same type. If a wind installation is formed by different wind turbines, aggregated model can be done grouping the wind turbines of the same type. Fig. 25. Wind farm modeling. where Si is the i-th generator apparent power and Pi is the i-th real power. When the aggregated model is used, the difference between the results obtained by the two models must be negligible. Fig. 26 and Fig. 27 show the results obtained in a example wind farm. Fig. 26 shows a comparison between the real power obtained by the simulation of a detalied and aggregated model. The blue line represents the results of the detailed model, the red line the results of the aggregated model and the green line shows the tolerance (10%). Fig. 27 shows the same comparison for the reactive power. In this case the aggregated model can be used because the differences are negligible during the simulation. Fig. 26. Real power in the detailed (blue) and the aggregated (red) model. Usually, when old installations are going to be verified according to PVVC, there are no available data to model the installation. In these cases, if the rms voltage during the simulation remains above 0.85 p.u., the wind turbines can be represented by a library model that takes into account the generator protections that would disconnect the installation. 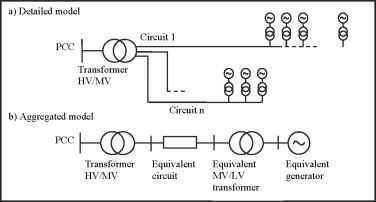 If the requirements to use library models are not fulfilled, that is, the voltage falls bellow 0.85 p.u. during the simulation, validated models of the dynamic parts of the wind installation (wind turbines and FACTS) must be provided by the manufacturers. The model validation must be done according PVVC (see section 6).